Shutout for nearly three quarters, Darien scored two touchdowns in the span of two minutes to erase a 7-0 deficit and post a 13-7 victory, advancing to the Class L final next weekend against FCIAC arch-rival New Canaan, a 17-0 winner over North Haven in the other semi. For top-seeded Darien (12-1), the comeback was business as usual. "This is the fourth week in a row we've played a Top 10 ranked opponent and the fourth game we've come from behind to win," Darien coach Rob Trifone said, referring to wins over North Haven and New Canaan in the regular season and a state quarterfinal last-play win over Daniel Hand. "This team shows so much heart. Some kids were down when we were trailing 7-0 at halftime. The mood was somber and a little pissed off. I pulled them together and told them we've been down before, what makes this game any different." Fourth-seeded Middletown (11-2) completely frustrated Darien's passing attack in the first half, limiting Blue Wave quarterback Silas Wyper to three short completions and intercepting him once. Darien's defense was equally stout, largely containing Blue Dragon quarterback Dario Highsmith, named the state Gatorade Player of the Year this week, on the read option offense. Highsmith, though, broke through for one big play - a 72-yard scoring run - and Van Uk's conversion gave Middletown a 7-0 lead with 5:50 left in the second quarter. The Blue Dragons had squandered an earlier chance to score after Sal Fazzino blocked a punt and Cody Carrillo recovered at the Darien 13. Highsmith (36 carries for 194 yards) fumbled on the next play and Darien's John Griffiths recovered. Middletown also missed an opportunity when Uk's 37-yard field goal attempt in the second quarter sailed wide. "We left some points on the board in the first half," Middletown coach Sal Morello said. "The way the defenses were dominating, you can't give away scoring opportunities." The game became a field-position chess match in the third quarter. Darien used a short Middletown punt to post a 29-yard scoring drive, tying the score on Wyper's 11-yard swing pass to back Jay Harrison. Daly Hebert's conversion made it 7-7 with 20 seconds left in the third. Darien forced Middletown three and out and benefitted from another short punt. On first down, Wyper hit receiver Jon Reed for a 37-yard touchdown pass. The kick was blocked leaving the score 13-7 with 10:52 left in the fourth. Middletown drove 16 plays to the Darien 18 on the back of Highsmith but his fourth-down pass was deflected by Darien's Myles Ridder. Darien couldn't run out the last three minutes. Middletown had one last shot for a two-minute drill and drove to the Darien 27 in the final minute. But Griffiths sacked Highsmith on third down and Blue Wave cornerback William Hamernick knocked away a pass in the end zone. Darien gained just 69 yards on 24 carries, led by Ridder's 12 carries for 46 yards. Wyper was 6 of 21 for 95 yards. Highsmith passed for just 14 yards on 2 of 10 passing. "You don't have to be a rocket scientist to know Highsmith is going to carry the ball three of four times and rightfully so," Trifone said. "We packed the box with seven and eight and did a pretty good job containing the Gatorade Player of the Year. Our defense has played lights out the last four weeks." Rushing: D-Myles Ridder 12-46, Jay Harrison 7-19, Silas Wyper 4-2, Nick Lombardo 1-2. M-Dario Highsmith 36-194, Jacob Homar 6-58, Isaiah Tompkins 4-13. Receiving: D-John Reed 2-52, Lombardo 3-23, Harrison, 3-13, Griffin Ross 1-20. M-Cody Carillo 1-8, Julian Carraway 1-6. Milford -- New Canaan is headed back to a state championship game. The effort from Nick Cascione and Frank Cognetta, and a stout defensive effort, made sure of that. The third-seeded Rams were held far below their season average for both points and yards, but an effective ground game, led by Cascione and Cognetta, lifted New Canaan to a 17-0 victory over No. 7 North Haven Saturday at Law High. The Rams (13-1) return to a state final after a one-year absence. 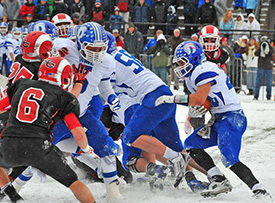 New Canaan will attempt to win its first title 2009, and ninth overall, when it faces Darien in the championship game. It will be a rematch of a regular season game won by Darien 28-24 on Thanksgiving. "This is huge," Cascione said. "We missed it last year for the first time in a long time (since 2005). It means the world that we can finally come back and finally right the wrong that we had last year (losing in the semifinals)." Cascione, who was named the game's most outstanding player, rushed 14 times for 74 yards and completed 8 of 19 passes for 202 yards and one touchdown. Cascione connected with Alex LaPolice on a 15-yard touchdown pass to give New Canaan a 7-0 lead in the first quarter. Peter Swindell added a 30-yard field goal to up the Rams' lead to 10-0 at halftime. Morgan Carson scored on a 4-yard touchdown run in the fourth quarter for New Canaan. The Rams, who entered having averaged 46 points, effectively ran the ball throughout the contest. Cognetta led the team with 25 carries for 136 yards. "We just took what they were giving us," Cascione said. "They only put five in the box, so that opened up the run game for us." Mike Halloran rushed 10 times for 97 yards, Cole Pecora gained 85 yards on nine carries and Ethan Suraci carried 11 times for 74 yards for North Haven, which had several drives stall in the red zone. RUSHING--North Haven, Mike Halloran 10-97; Cole Pecora 9-85; Ethan Suraci 11-74; Mike Montano 9-19; Pat Mikos 1-3. New Canaan, Frank Cognetta 25-136; Nick Cascione 14-74; Morgan Carson 9-36; Cole Turpin 1-3. PASSING--North Haven, Mike Halloran 0-9-0-0; Cole Pecora 0-2-0-1. New Canaan, Nick Cascione 8-19-203-1; Teddy Bossidy 0-1-0-0. RECEIVING--New Canaan, Kyle Smith 4-147; Alex LaPolice 3-43; Frank Cognetta 1-12. Stamford - New Canaan's Alex LaPolice returned the kickoff 61 yards to start Saturday's CIAC Class L championship. LaPolice's play set the tone the rest for the game for the Rams. They scored on that drive and went on to rout Darien, 44-12, to win the program's ninth CIAC state title at Boyle Stadium and atoned for a Thanksgiving Day loss to their rival. The fourth-seeded Rams finished 14-1 and also won the Fairfield County Interscholastic Athletic Conference title. 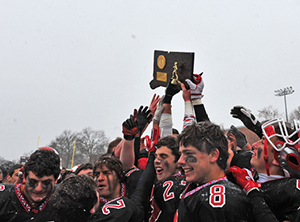 "From the opening kickoff, they came down the field and scored right away," New Canaan head coach Lou Marinelli said. "I think our kids were just determined. I think they were tired about hearing how they lost to Darien (28-24) and maybe they're not for real, their overrated and everything else. "I really think they played with a chip on their shoulders." It was a CIAC state-record ninth state championship for Marinelli. 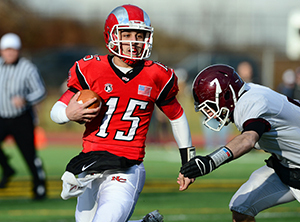 Senior Nick Cascione completed 14 of 24 passes for 226 yards with two touchdowns and two interceptions for the Rams. He also ran 11 times for 76 yards and a score. "We looked at it (the Darien loss) as we've got to get better," Cascione said. "We really humbled ourselves after our loss and came in the next day and started from scratch and built from the ground up." LaPolice had four catches for 86 yards and a touchdown and also scored on a 43-yard punt return. Frank Cognetta ran 12 times for 68 yards and a score for New Canaan and Cole Turpin added four catches for 65 yards and a touchdown. Peter Swindell also kicked a 30-yard field goal. Zach Allen deflected a pass at the line of scrimmage, caught it, and returned it 44 yards for the Rams' final touchdown. Silas Wyper ran for two touchdowns for the top-seeded Blue Wave (12-2). "I said (to the team), 'Look, I know you're hurting right now physically and emotionally, but don't let this tarnish what has been a magical ride from a group that people expected to be 6-5, etc. '," Darien coach Rob Trifone said. "(It was) an incredible season for a group that graduated everyone last year."